Last weekend I turned 27. This is the first year my age caught in my throat as I said it... not because I think 27 is particularly old, but more because I realized I'm in my late twenties and I really am supposed to be all grown up and responsible by now. And so with that on top of the fact that this year was my "golden" birthday (turning 27 on the 27th) and I just really love birthdays in general, the celebrations were especially lengthy and festive. I treated my birthday twin to lunch... between the two of us we're 30 this year. and then my boys took me to one of my favorite restaurants, Wild Honey, to have breakfast for dinner. 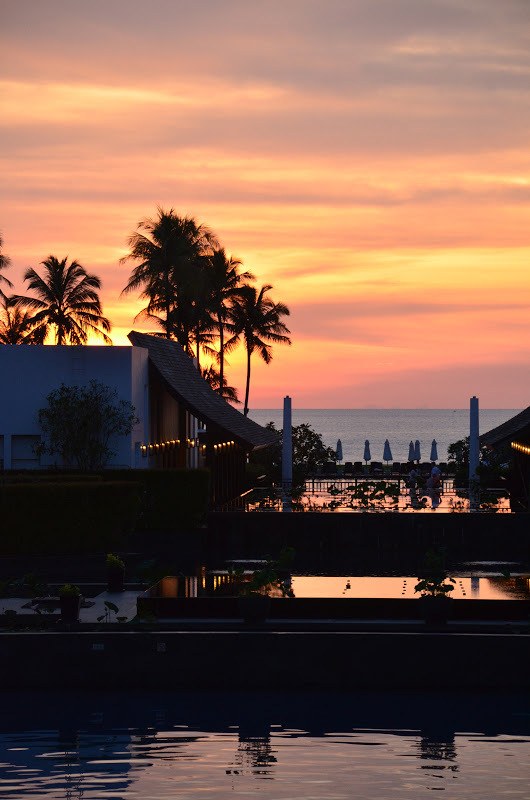 And then, of course... when you're feeling like adulthood and responsibility are officially upon you, what else do you do but book a weekend beach get-away to Thailand with your family on a whim? It's really the only natural thing to do, I think. so Jon fed her an apple. Khao Lak was one of the most devastated areas in the 2004 tsunami. There's still a huge boat 2 kilometers inland that was a kilometer out at sea when the tsunami hit and was swept up the hill into the jungle. The local people there remember it and it was interesting to hear them reflect. So why, you may ask, would one choose to go to a place that is so prone to total destruction at a few hours' notice? Fabio even had another birthday surprise up his sleeve when he booked a special surprise candlelight dinner on the beach for us at sunset, while Jon watched Barney in Thai with Grandma in the room. Fabio was quite the romantic little devil this year, which is especially impressive when you consider that on my first birthday after we were engaged he gave me a weird backpack and asked, "So what do you feel like doing?" as we climbed into the car that night. Fortunately he is a very fast learner! Oh yeah, and our last day there was Halloween... so Jonathan was a shark and we were his victims, for about six minutes. Then we all took off our bandages and fleece shark jackets (poor guy!) and jumped in the pool. We basically spent four days on the beach, at the pool, drinking fresh fruit smoothies, or taking naps. Since it was a special occasion, we even got Shirley Temples at the pool bar... and the bartender gave Jon his own little fruit juice "mocktail"! It was adorable. And with that I said, "Come and get me late twenties, however significant or insignificant you may really be!" I wouldn't change a single thing about my life right now--I have everything I ever hoped for, and so many things I would have never dared hope for. Twenty-seven is going to be a good year. Jon drinking his mocktail is soooo cute!